Celebrating inclusive sport at Shawlands Academy | LEAP Sports Scotland Aileen Campbell, Minister for Public Health & Sport, today met with pupils from Shawlands Academy to talk LGBTI Inclusive Physical Education. 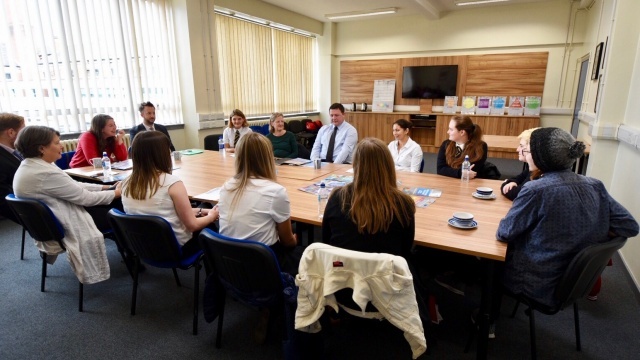 "> Aileen Campbell, Minister for Public Health & Sport, today met with pupils from Shawlands Academy to talk LGBTI Inclusive Physical Education. Aileen Campbell, Minister for Public Health & Sport, today met with pupils from Shawlands Academy to talk LGBTI Inclusive Physical Education. Today is National Fitness Day, but not all have equal access to opportunities in sport and physical activity. A report by LGBT Youth Scotland highlights the poor uptake of physical activity amongst LGBTI young people, whilst research released yesterday by Stonewall Scotland showed that one in 5 LGBT young people have experienced bullying in changing rooms. 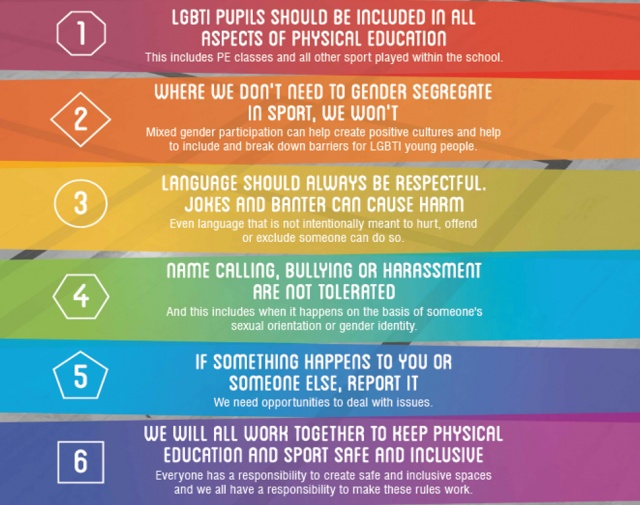 Feeling the impact of being excluded from PE, LGBTI pupils from Shawlands Academy worked with Scotland’s LGBTI sports charity, LEAP Sports, and developed their Manifesto for Safer Sports at Shawlands Academy. The Manifesto outlines 6 principles that pupils wanted the school to commit to in order to make PE more inclusive. This includes taking a stand against homophobic language and the responsibility to report this and other forms of bullying behaviour. Building on the work of Shawlands, the Manifesto for Inclusive Physical Education has been developed as a tool which is now being offered to other schools across the country and which LEAP Sports is using to work with PE teachers and with schools. Aileen Campbell MSP, Minister for Public Health & Sport, said “There should be absolutely no barriers to sport, but unfortunately we know that LGBTI young people can be put off taking part due to fear of bullying or name calling. 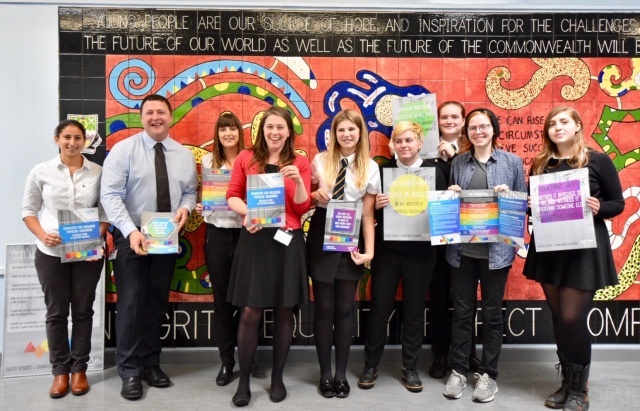 Ann Grant, Headteacher of Shawlands Academy, said “We are delighted that our young people have taken the lead in this initiative as well as a range of other activities to ensure that all LGBTI pupils in our school know that they are included and valued”. Hugh Torrance, Executive Director of LEAP Sports Scotland, said: “The Manifesto for Inclusive Physical Education is an important tool for schools to help ensure that steps are taken towards making PE and school sport accessible for everyone. The Manifesto has come from the lived experiences of school pupils in Scotland, and we’re delighted to see the pupils from Shawlands being recognised for their work today”. You can read more about the Manifesto here. Written on 27th September 2017.